Basket Shelf by Metro Shelving has 400 lb weight capacity, 4 inch deep basket, ideal for containing and displaying smaller items. Posts not included. Metro Light-Duty Basket Shelves are 8″ deep and are ideal for containing and displaying larger items. Available in 18″ depths and 24″ and 48″ lengths. Available in Black or White only. Order Super Erecta posts (black or white) separately. 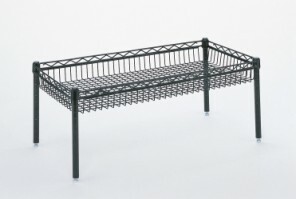 Metro Light-Duty Basket Shelves are 8" deep and are ideal for containing and displaying larger items. Available in 18" depths and 24" and 48" lengths. Available in Black or White only. Order Super Erecta posts (black or white) separately.